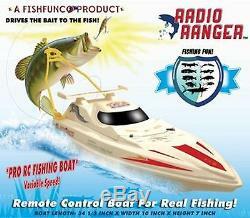 Radio Ranger ll" 34" Remote Control Fishing Boat UPGRADED 2.4Ghz Remote System. This is a brand new: Radio Ranger ll" 34" Remote Control Fishing Boat UPGRADED 2.4Ghz Remote System Our biggest, New 2.4 gHz Radio System with Variable Speed. 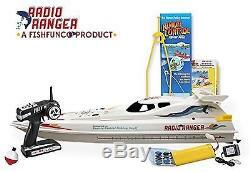 This is the new 34" "Radio Ranger ll Model Remote Control fishing boat. The New Ranger ll includes a variable speed controller. The boat goes fast or slow. It's almost 3 feet long, that is a big RC Boat for catching fish! Remote control boats are for real fishing. Catch small Panfish, Bass, and big fish like Pike! The biggest rc fishin' boat we have! Catch any size fish with this huge one! The New Radio Ranger ll is great around the dock fishing for little fish, the kids love it! The Radio Ranger ll can also drive out 300 feet, so for the real fisherman it's not only a blast, it's very useful for driving the fishing line out to record distances, and getting the line where you can't cast! There's never been more fun fishing than being able to use a remote control boat and going fishing at the same time. The Radio Ranger ll is not like the novelty "toy" boats that catch only little fish, The Radio Ranger ll includes the RC Fishing Pole and is designed so you can catch big fish too! Put the 34 Radio Ranger in the water, and go fishing the new way, rc fishing! The Radio Ranger is the biggest rc fishin' boat around! The Radio Ranger comes with complete, illustrated, easy to understand fishing instructions, and everything to get started rc fishing. 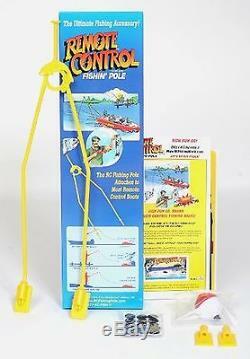 For small fish attach your line to "The RC Fishing Pole", (included) , and the boat pulls em. For big fish attach the line from your fishing rod. Instead of casting, you drive your line out, when a fish hits, the line disconnects, and you reel em in! Hours of exciting remote control fishing fun at the lake, or on the pond! Variable Speed - Everything included ready to go fishing rc boat! Boat, The RC Fishing Pole, 7.2V-1800mah boat battery, Pistol grip transmitter w/batteries, wall charger, boat stand, extra propellers, fishing line, bobber, and fishing hook included - 300-400 foot range - NOTE-PLEASE USE UNDER ADULT SUPERVISION IF UNDER 14-REMEMBER THE SIZE OF THIS, ALMOST 3 FEET LONG, AND ELECTRONICS. THIS PRODUCT REQUIRES READING THE INSTRUCTIONS THOUROGHLY TO AVOID SIMPLE TECHINICAL PROBLEMS-ESPECIALLY BATTERY CHARGING 5-6 HOURS (NOT OVERNIGHT)-THE 8 AA BATTERIES MUST BE PUT INTO THE REMOTE CONTROLLER "PROPERLY" IN ORDER FOR THE BOAT TO WORK. Is only relevant for this item: Radio Ranger ll" 34" Remote Control Fishing Boat UPGRADED 2.4Ghz Remote System. We do not accept P.
The item "Radio Ranger ll 34 Remote Control Fishing Boat UPGRADED 2.4Ghz Remote System" is in sale since Tuesday, May 10, 2016. This item is in the category "Toys & Hobbies\Radio Control & Control Line\Radio Control Vehicles\Boats & Watercraft".av" and is located in US. This item can be shipped to United States.